Three weeks ago we published the article “Good Night Irene Ross Is Gone …” and Skerrit apologists responded with the “Fake News.” Prior to the “Good Night Irene article we also revealed that PM Skerrit had deliberately avoided a scheduled meeting with Ross Personnel and that the Ross representatives were quite disappointed and felt disrespected. Now that our stories have been completely validated what does that say about Massinthecemetery eh Tony? What we know for sure is that while the media is way too drunk and compromised on Skerrit’s wine, massinthecemetery is dutifully filling the void left by the floundering media. We are working behind the scene to keep the people enlightened. A democracy can only exist when the people are informed. Left to the devices of Roosevelt Skerrit, Wee Wee Pequinio , Minister Lang Sal , Parry Bellot et al, the people of Dominica would be better off left in the dark. MiTC will have none of it. With Ross gone and 30% of Dominica’s GDP obliterated, the government must now be honest and forthright in the handling of the people’s affairs. As a country in crisis we insist that it is time that the Roosevelt Skerrit administration work to insure that all hands, wallets, relief supplies , hidden accounts both domestic and offshore accounts are placed on the family table. Whoever own those offshore accounts we sing “Bring them in, Bring them in , Bring all the wandering accounts back to Jesus." We learnt through the Panama Papers that Dominica as a country owned a secretive offshore account and the Prime Minister and Minister Of Finance is yet to offer an explanation of the alleged bank account in Panama. We are saying it is crunch time Prime Minister Skerrit we want to know about this account. 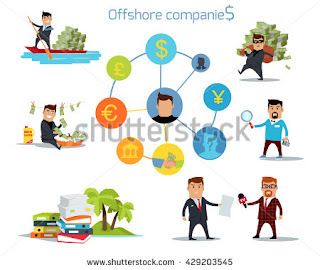 Through our relentless investigation and with the help of very resourceful confidants we also discovered the existence of some secluded offshore accounts that are allegedly directly related to Dominica. The details presented to us show the banks, account number and the amount of money in those accounts at the time of discovery. We are not at liberty to disclose the full identification numbers for these accounts, nor are we going to release the true names behind these accounts . What we will say is that the accounts belong to “Kor Pere Voler and Kor pere Chien” and if at some time in the future the Financial Investigation Unit or even the government Of Dominica becomes interested in pursuing these accounts the information is available in it’s entirety. The information shows that between 2007 and 2010 there was already US $64.67 Million hidden in offshore accounts just between Kor Pere Volere and Kor Pere Chien. We can well imagine how much more have been accumulated from 2010 through 2018. It is also very important to note that the account information as shown may very well be outdated. Some accounts may be dormant or some may have been relocated. Some of the banks noted, have at some point been under much scrutiny and international law enforcement investigations and so it would be quite reasonable to assume that accounts may have been moved around as a result of scrutiny. The undeniable truth is that Dominica has been used as the personal fiefdom for Kor Pere Voler, Kor pere Chien and acolytes as they all hasten to build big money empires. The departure of Ross University is already causing great consternation and hardship on the masses we are sincerely asking the government departments to do their work without the interference of the politicians - please return the monies from all the offshore accounts particularly those belonging to Kor Pere Voler and Kor pere Chien. Try to link referenced articles like "Good Night Irene Ross Is Gone"
1. it helps with your search engine ranks. 2. it helps others who have not read the referred article to get easy access to it. Thanks m.i.t.c, very reliable source of information. Wow! !Great Work. Mitc has always shown that you are on top of the shady happenings in DA. Keep going. Things are falling into place. NB. PLEASE USE THE PEN NAME "Flaslight"